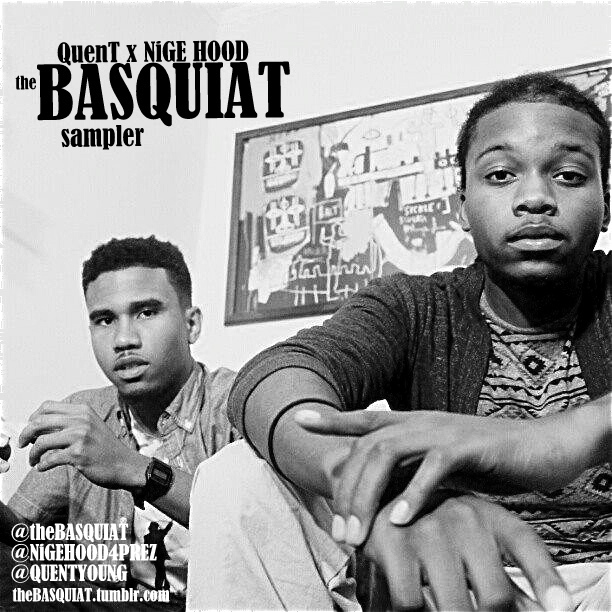 NC emcees and GUE favorites QuenT and NiGE HOOD have been working hard on their collaborative project The Basquiat, and decided to share 7 of the EP's tracks as a sampler of what's to come. Check out "Choices," one of my favorites, below, and hit the jump to download The Basquiat sampler. QuenT and I decided to do a collaboration EP as a precursor to solo projects we each planned to drop this summer. Very soon after we got started we noticed a chemistry in our lyrical styles, song-writing ideas and work ethic. This release is a sampler for the final project which will about 8 or 9 include more songs. The name "The Basquiat" was inspired by Jean-Michael Basquiat, a famous black painter from the 1980's who died tragically at a young age. The idea behind the title is that our words on every song paint vivid imagery and emotion--and the holistic outcome is a masterpiece. I had a lot of fun recording this with QuenT and I am excited to see the world's reaction to our work.